Two postings ago, we had been discussing how time is marked in The Hobbit. After a one-post interlude—a book review—we were intending to extend our discussion (as our original plan was) to The Lord of the Rings, but something caught our attention and, in this posting, we’re still interluding—although it is about The Hobbit. They go on till Bilbo and the dwarves reach the trolls. Here, though, we want to pause for a moment and look back, and, like any careful—and curious—traveler, consult a map. First—and this is something we noted in that previous post—there is really no hard evidence for just how long this leg of the trip took. All we are given are “At first”, “now and then”, “Then”, and “Now”, and the sense of distance comes to us as much through landscape changes as from those vague words: from “hobbit-lands” to “lands where people spoke strangely…” then “Now they had gone far into the Lone-lands”. Second, looking at that map, there are certain puzzling words in that description of travel. The description twice says “roads”, at first “good roads”, then, as the journey goes eastwards, “the roads grew steadily worse”. Our map, however, shows only one road, the East or East/West Road, the history of which goes far into the history of Middle-earth and which we have always imagined that JRRT modeled on the remains of Roman roads one could still walk in England in his time—and even today. As it was destroyed in the conflict against the Witch King of Angmar, we would certainly agree that “wicked people” had once been involved in its history. As well, it’s good to remember that, for the most part, the company in The Hobbit is traveling at its own speed, a speed determined primarily by the countryside they cross and their trip seems—if occasionally miserable—almost leisurely, especially in comparison with The Lord of the Rings, in which so much of the first volume in particular lays out a route along which several of the main protagonists are driven by evil pursuers. The journey itself, in the latter, becomes, day by day, the focus of the narrative as they attempt to escape the Nazgul and that day-by-day quality is intensified after the wounding of Frodo on Weathertop, as he begins to fade and his friends are desperate to reach Rivendell. This change in the narrative emphasis, from discrete events along a route in The Hobbit, to an emphasis upon the journey itself, will bring us back to our original discussion on the marking of time—moving now from the earlier book to The Lord of the Rings in our next posting. We would guess, by the way, that that “ancient stone bridge” mentioned above is the so-called “Last Bridge”, which Glorifindel calls “the Bridge of Mitheithel” (The Fellowship of the Ring, Book One, Chapter 12, “Flight to the Ford”) and which crosses the River Hoarwell (“Mitheithel” to the elves) on the East Road. We have just said goodbye to an old friend, E, who stayed all too briefly with us on his way to and from a conference. E, like us, is a big fan of maps and we had a lot of conversation on the topographical charting of Middle-earth, particularly as seen in The Lord of the Rings. A map forms the basis of the plot of The Hobbit, of course. The idea of making a map, rather than a story, first reminded us of an earlier author, who once said much the same thing. was on an extended tour of central and eastern Scotland with his parents, his wife, and his stepson, Lloyd Osbourne. In fact, as Stevenson writes earlier in this essay, it was not, in fact, his first book, or even his first novel, but it was his first published novel. After its inspired beginning as a map, it first saw publication not as a novel, but as a serial in 17 installments in a magazine called Young Folks, from 1 Oct, 1881 to 28 Jan, 1882, under a pen name, “Captain George North”. Its first appearance as a novel was in November, 1883, with the title, Treasure Island, or, The Mutiny of the Hispaniola. with its wonderful, atmospheric illustrations by NC Wyeth. But what about the map which started it all? So here is that second version. We will end here as, inspired, we’re off to redo the map for our imaginary medieval Russia, Cherna. Welcome, dear readers, to the third installment of our rough portrait of the Shire. We call it a “rough portrait” because, so far, we’ve relied upon only three sources: The Hobbit, The Lord of the Rings, and The Letters of J.R.R. Tolkien. We’ll continue to do so in this installment, but we will add two works of geography, K. W. Fonstad’s The Atlas of Middle-earth and Barbara Strachey’s Journeys of Frodo (although we may take a hint of two from other works). So far, we’ve discussed the government of the Shire (Shire Portrait 1) and the economy (Shire Portrait 2). In this, we want to move on to the geography of the Shire. We begin with Fonstad’s map. and it is navigable, at least by small boats—after all, it was in such a boat that Frodo’s parents were drowned. As well, there is the Bridge of Stonebows on the Great East Road. Since it’s wide enough for gates and is reported to have had houses on the far side of it, we might imagine it to look like the Old Dee Bridge, at Chester, in England. This bridge dates from Norman times (although there was a bridge there from the days of the Roman occupation—“Chester”, after all, is only a corruption of castra, Latin for “military camp”—founded as Deva Victrix in 79AD), with the present version being more-or-less 14th-century. In the Prologue to The Lord of the Rings, the Bridge of Stonebows is said to have been “built in the days of the power of the North Kingdom”, making us wonder whether the Dwarves, who had cut the Great East Road long before, had only had a ford at that place. To the west of the river stretches the Shire, most of it to the north and south of the Great East Road, which acts as a kind of spine, there being subsidiary roads leading off it towards the various villages. Originally built by the Dwarves in the First Age, it led from Doriath in Beleriand eastward beyond the Baraduin towards the Misty Mountains. 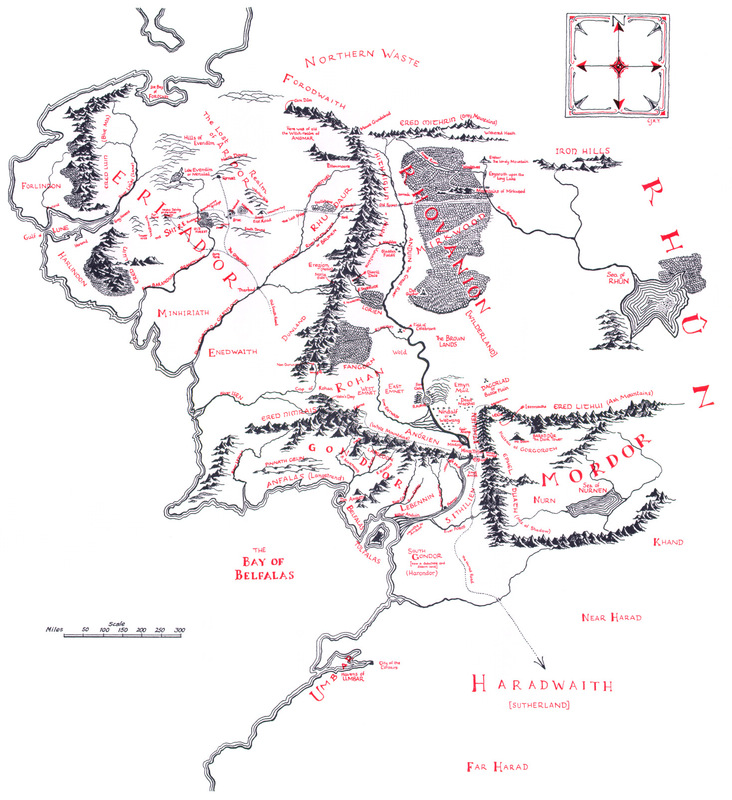 After the destruction of Beleriand, the remaining section ran only from the Grey Havens eastward. When Marcho and Blanco, the Fallowhide brothers, gained permission to colonize the area in TA1601 from Argeleb II, the only payment required was “that they should keep the Great Bridge in repair, and all other bridges and roads, speed the king’s messengers, and acknowledge his lordship”, which would have included the Great East Road. In a previous posting, we talked about the North-South Road (later, the “Greenway”, which once ran from Fornost Erain, in the north, to Minas Tirith, in the south. Because of its ancient importance and places like the causeway and bridge at Tharbad, we imagined it to be like a Roman road—carefully laid out by engineers and paved but, no longer maintained, gone to seed. Because of its great age and one-time importance, we’ve always pictured the Great East Road to be similar, especially when it is clear that the kings of Arnor considered its maintenance to be the equivalent of tribute or taxes from the new Shire. Subsidiary roads which split off from the East Road, however, we might see as the usual rutted country roads. 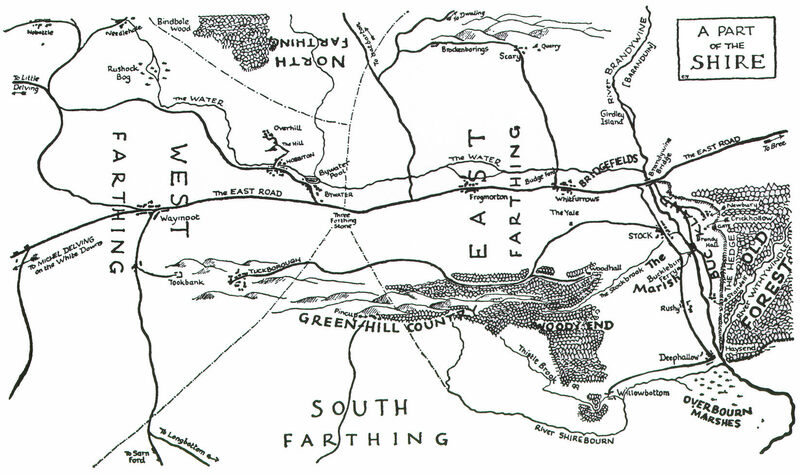 The Shire, besides being bisected by the Great East Road, is also divided into four parts—hence the name “Farthings”—like the pre-decimal English coin, which was a fourth part of a penny (when a penny obviously was worth a lot more!). We wonder what these divisions were intended to be used for—perhaps for the election of the Mayor? In our previous posting on the government of the Shire, we quoted JRRT as saying in the Prologue to The Lord of the Rings, “The Shire at this time had hardly any ‘government’”, so, for the moment, that’s our best guess. Just south of the Great East Road is the Green Hill Country, which appears to be heavily forested. This is mirrored by a smaller wood north of the road, Bindbole. Other than these (and, of course, the Old Forest in Buckland), the land seems to be open. To the north are the North Moors. These are windy uplands, mostly grass, with little in the way of trees. Dartmoor (which is the image above), in southwest England, seems so bare (although it has the fallen remains of earlier cultures on it), that it can seem a little spooky—the perfect setting for Sir Arthur Conan Doyle’s Sherlock Holmes novel The Hound of the Baskervilles (first published in book form in 1902). Last of all, there’s the South Farthing, stretching south of The Green Hill Country. As it is a tobacco-growing area, but in a temperate climate (at least, we understand that the Shire is in a temperate zone—they appear to have—or to have had—snowy winters), we visualize it as looking like the Connecticut Valley, which runs south down from Vermont, through western Massachusetts and through central Connecticut, in the US. In the central part of the valley are tobacco plantations. These always include drying barns for the tobacco—which would become the Longbottom Leaf Merry and Pippin discover two casks of in Saruman’s pantry. The one farthing we haven’t studied directly is the East Farthing, but, as it contains a continuation of the Green Hill Country, abuts the Brandywine, and has the already-mentioned bridge of Stone Bows, and thus has no main features we haven’t mentioned, we’ll conclude here for the moment. In our next, we want to examine Shire architecture, from hobbit holes to mills. In our last post (well, next-to-last–the last was on circuses), we talked about museums and Mathom-houses and, thinking that the Shire had a museum, made us wonder about what we might call “Shire culture” in general. What is it which makes the Shire the Shire? To go about answering that, we tried to think of a model. Could we imagine ourselves doing a tourist brochure? A wiki article? And where would we begin? Suppose, we thought, we begin with the outermost shell, rather as in our world: the government. The first ten pages of the Prologue to The Lord of the Rings contain a good deal of information about hobbits and their homeland, with many other details to be gleaned from the main body of the text and the appendices and some from The Hobbit. There is undoubtedly more yet to be found in several of the subsidiary volumes, but we decided that, to make this a series of readable posts and not a small encyclopedia, we would stick to the two main works. With all of that material to help us, all we needed was an entry point—and, almost immediately, we decided that we could begin where we left off, with that very museum, which originally attracted us because it stood out as something one would expect from a much more organized state, rather than from what, on the whole, appears to be such a rural and decentralized place. or any of the other thousand wonderful museums around the world, big or small. And yet it is there and in the closest thing to a capital which the Shire has to offer, Michel Delving. It is only the closest thing because the Shire has almost no formal governing structure. Originally, as the Prologue tells us, the Hobbits had moved into the land which would become the Shire with the permission of the high king of the North Kingdom, at Fornost. When the last king and his kingdom had fallen to the Witch King of Angmar, the Hobbits replaced him with a “Thain” (actually an Old English word for, among other things, a “vassal”—that is, one who acts as a subordinate—in a feudal system, this might imply that the person has received land from someone higher on the social scale in return for taxes and/or military service). Here’s a thegn (Old English spelling) as a warrior. “The only real official in the Shire at this date was the Mayor of Michel Delving (or of the Shire), who was elected every seven years at the Free Fair on the White Downs at the Lithe, that is at Mid-summer. As mayor almost his only duty was to preside at banquets, given on the Shire-holidays, which occurred at frequent intervals. But the offices of Postmaster and First Shirriff were attached to the mayoralty, so that he managed both the Messenger Service and the Watch. These were the only Shire-services, and the Messengers were the most numerous, and much the busier of the two. By no means all Hobbits were lettered, but those who were wrote constantly to all their friends (and a selection of their relations) who lived further off than an afternoon’s walk. This gives us the whole of the top level of Shire culture, the public face: a vestigial Thain (representative of the long-gone King), a figurehead Mayor, a postal service, and a tiny police force/border guard. And how does any of these hold office? The Thain, as we know, is hereditary. The “postmen” (our word) are, so far as we can tell, a mystery, both as to who they are or how they gain their employment. Considering that there is a small policing force, as well as a kind of postal institution, we looked for another government department: the Internal Revenue Service. After all, we pay for our police and used to pay for postage stamps, back in pre-internet days, and we pay for public museums, too: how does it work in the Shire? The simple answer is, we don’t know. In fact, we don’t really know much about how the economy works in general. And that will be the subject of our next posting. To give us a sense of where our characters and we were (and still are) going. When we began talking about the geography of our alternative Russia, we began to ask ourselves, first, how do you make a map in relation to a story? It was a start to look over the shoulder of JRRT, and to see what was done before us. From there, we go on to ask, what is it that made Middle-earth Middle-earth? 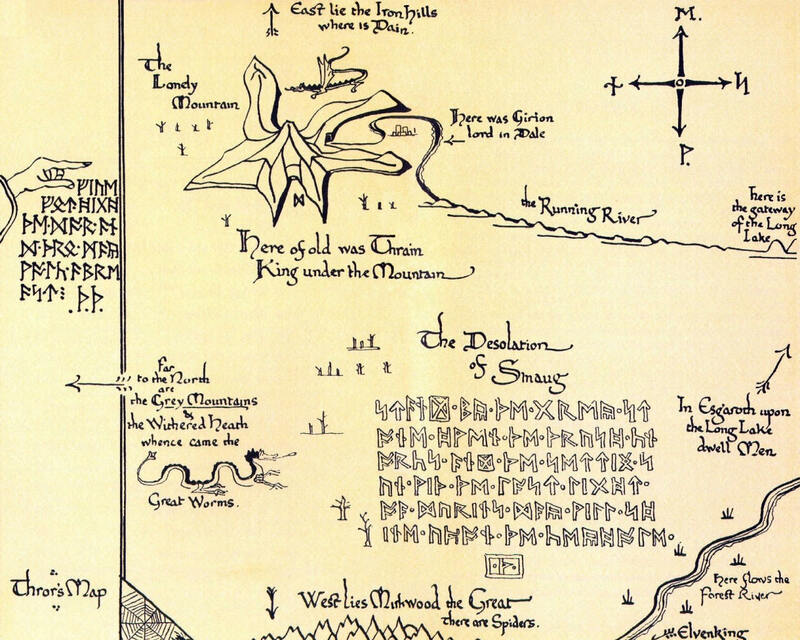 It’s clear that Tolkien took a considerable amount of time and care to chart out his elaborate fictional world, from Bilbo’s own maps of the Shire and the world beyond. Some were detailed enough to follow the day-by-day travels of the Fellowship, while others were used to record specific moments in time, both historically and geographically. 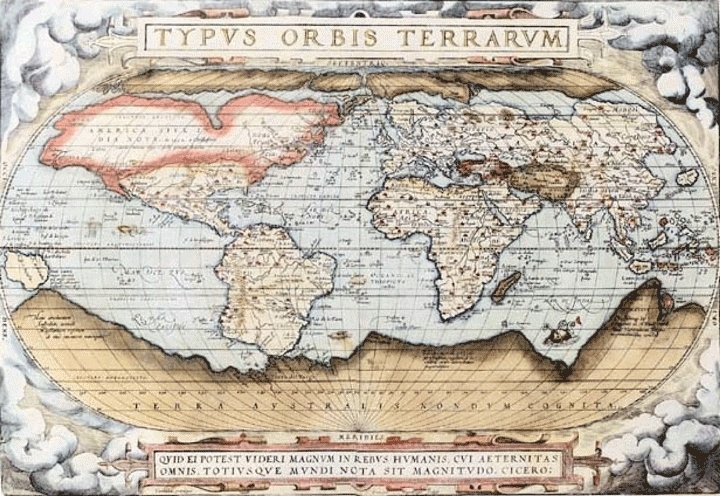 In his letters, Tolkien often addressed the subject of his maps. Much of his enthusiasm in creating maps for his worlds had to do with the pleasure of doing so, and the satisfaction of building the physical structure of such an elaborate story. He was, however, sometimes overwhelmed by them—perhaps as if the more landscape he made, the more he had to carry—and said to his publisher that it was a matter of a “lack of skill combined with being harried” (Tolkien, letter 141). He was fortunate to have, in this aspect of his work, collaboration not unlike ours—his son, Christopher, was a talented cartographer, and after discussing the landscapes with his father, would draw the intricate world in accordance with Bilbo and Frodo’s adventures. Tolkien, by creating the maps first, created a landscape which seems to exist not only before the story, but is bigger than the story. When Frodo travels eastwards, for example, there is more of the Shire and beyond than that which he actually travels over. In our case, it was rather like someone laying track while driving a train over it. The tracklayer decides where the train will go, but, looking back, can see a landscape left behind as it moves on. In this way, the story and its landscape are written as they progress, and a narrative railroad is left behind on which readers may ride. And so, unlike Tolkien, by constructing a map this way, we appear to be providing primarily a view from the track itself. 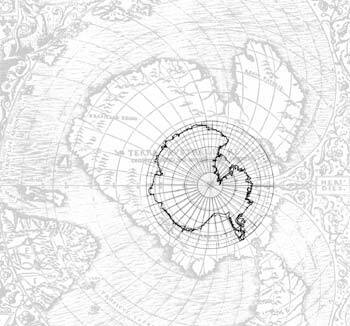 If there’s more landscape, we can only know it from the map we’ve constructed afterwards. With the previously-drawn map, we can see the journey, in contrast, from a bird’s eye view. But this leaves us with a question: is it best to construct a bird’s eye view first, then to lay the track, or to lay track and then to look back? This brings us to a second question: by either method, how does one make a fictional map credible? For an example of simultaneous train-driving and track-laying, see Wallace and Gromit, The Wrong Trousers.